Professional peeling is an important precondition for effective skin rejuvenation. Gentle abrasion of the dead skin cells creates the ideal condition for effective nutrition to the deeper skin layers. Microdermabrasion at Skin & You Clinic, Mumbai, offers the ultimate peeling solution – it is controlled and gentle, yet highly effective and suitable for every skin type. Immediately after a treatment, the skin looks fresh and rosy and the results improve with every treatment. It is a process that exfoliates, polishes, and increases the lymphatic drainage of skin. It uses a gentle vacuum to bring your skin in contact with crystals that gently remove the top layer of dead skin. It can be used to help treat various skin conditions such as acne, Comedones (blackheads), and dull or rough skin. It is most commonly used on the face, but can be also used on the neck, back, and hands. Microdermabrasion is a process that exfoliates the skin using a gentle vacuum that brings skin into contact with the crystals. It can be used for various skin conditions like acne scars or to simply improve dull or rough skin. Microdermabrasion takes around 30-45 minutes and usually a few sessions are required for optimal results. Temporary redness may occur after microdermabrasion. Prior to microdermabrasion, your face is thoroughly cleansed. The microdermabrasion head is then systematically passed over the face multiple times. Particular creams or serums are put on your face after the procedure has been completed. After microdermabrasion, your skin may appear red and this usually persists for a short time and you will notice that your skin feels soft and smooth afterwards. Please stop all applications 2 days before the day of treatment. We recommend a gap of 3-4 weeks between the microdermabrasion. Avoid any applications for 3 days after the treatment. 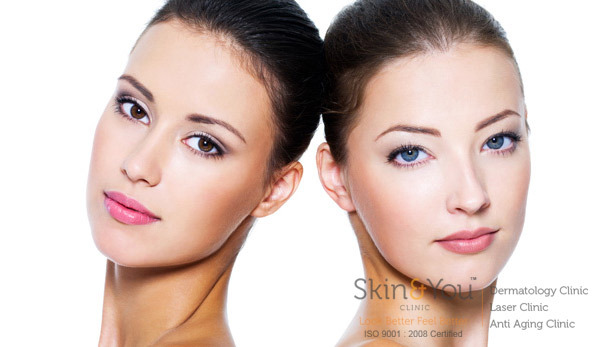 Why Skin & You Clinic for skin polishing procedure? We at Skin & You Clinic use the safest and sterilised crystals; the procedure is done under complete medical guidance. Skin polishing procedure can be combined with all tretments possible such as Peels, Alma Photofacial, Botox and Fillers to give a Cumulative result.